Lemongrass is a popular ingredient in the Asian kitchen. It is one of the most widely used herbs in Chinese and Thai cuisine and the Indian kitchen too is becoming familiar with it. However, do you know that lemongrass oil has been a popular healing oil too? It has all the goodness of the lemongrass plant and is light, citrus oil. Lemongrass oil, or Indian Verbana, as it is often called in our Indian households, is a very popular oil found all over Asia. The oil is obtained by partly drying the lemongrass leaves and then steam distilling them. The resulting oil has a sweet, citrus smell and is yellow to deep red in color – depending on the quality of the leaves and the distillation process. The oil contains chemicals such as citronellal, nerol, citral, neral, geranyl acetate and limonene. Antispasmodic: The essential oil of lemongrass plant can be used for the treatment of stomach and intestinal spasms. If you feel nausea and experience heartburns, a drop of lemongrass oil should quell the symptoms. It relaxes the muscles of the stomach and the intestines, controlling the spasms and easing the nausea. Though this would be an ideal solution to morning sickness experienced during pregnancy, pregnant woman should not use the oil without consulting a doctor. Anti inflammatory: Lemongrass essential oil can help treat both internal and external inflammation. It is excellent for treating respiratory and sinus infections caused due to inflammation of the internal membranes. The oil soothes the muscles and membranes, relieving inflammation. Anti-Cholesterol: People with high cholesterol can certainly benefit from lemongrass oil. Simply add a drop or two of the oil in your soups or curries and enjoy the citrus flavor as well as the cholesterol reducing benefits of the lemongrass oil. 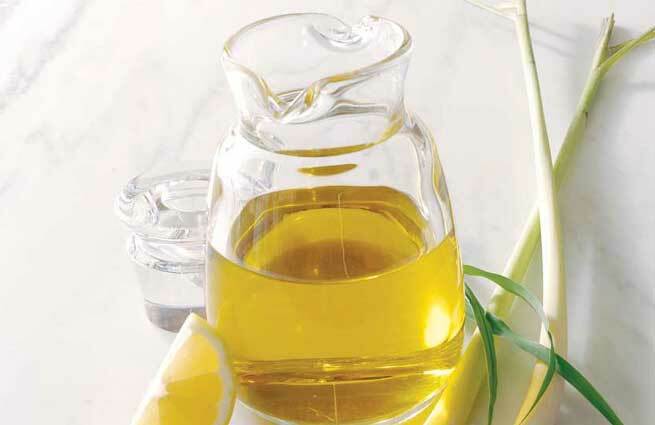 Anti-Exhaustion: Lemongrass oil has revitalizing and energizing properties. After an especially exhausting day, just diffuse a few drops of the oil in your room. The citrus aroma is extremely pleasing and helps revitalize you completely. You will feel energized and ready for more work. A lot of people use it for getting over jetlag as well. Tonic: The oil is considered an excellent tonic as it can help improve the overall parasympathetic nervous system. A massage with lemongrass oil, mixed with a carrier oil, can help stimulate glandular function. It also soothes the body, revitalizes it and helps recover from illnesses. If you or someone in your home has been sick for some time, regular massage with this oil can help speed up recovery. Anti-Fungal: The anti-fungal properties of lemongrass oil make it an excellent home remedy for athlete’s foot and other fungal infections. Like tea tree oil, lemongrass oil can also be applied topically to treat fungal infections of the skin, including ringworm, nail fungus and even eczema. However, always use the essential oil by blending it with vegetable oil to dilute its potency. Cosmetic Benefits: Lemongrass oil has many cosmetic benefits also. It can be added to creams and ointments to lend them its healing and cosmetic powers. The oil can be beneficial in the treatment of acne. For those who have oily skin, lemongrass oil can work wonders. Just add a few drops of it to your daily moisturizer and it will make your skin appear younger and feel softer. Lemongrass oil can be used topically, consumed orally or diffused for aromatic uses. However, before consuming the oil, always consult a physician or an aromatherapist. You can use the oil on your skin, but some people are prone to developing sensitivity to it. So always try it on a small patch of skin a night before you intend on using it. If by morning, you do not experience any irritation, redness or swelling, it is safe to use the oil on your skin. In case you do experience irritation, consult a doctor or an aromatherapist for alternate options of treatment.